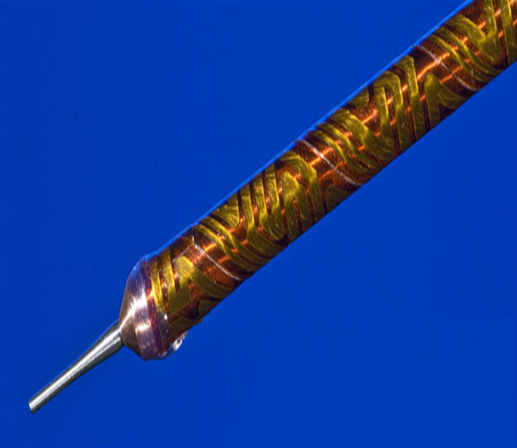 Birk Manufacturing’s core business is the design and production of flexible heating elements, insulated with Kapton® or reinforced silicone rubber. Our intention is to be the very best at surface mount flexible heaters and their applications. Birk not only designs and builds a thermal circuit to meet your needs, but also can apply the heater to your part and provide a complete assembly including wiring harness, testing and packaging. An example of this can be seen above. Our customer requires very even heat over the surface of a metal part with a temperature tolerance of plus or minus .5 degrees. We designed a Kapton® heater with multiple watt densities to create uniform heat distribution. The flexible heater is then wrapped around the metal part and value added tasks are performed. When finished, the assembly is then tested, calibrated, and can be serialized. The customer can now receive the full assembly, drop in place and plug the unit into their instrument. All components are purchased and quality controlled by Birk, who takes pride in providing a high quality sub-assembly.